UNITED NATIONS, Apr 25 2017 (IPS) - Despite progress, many gaps remain in international indigenous rights protection, said representatives during an annual UN meeting. 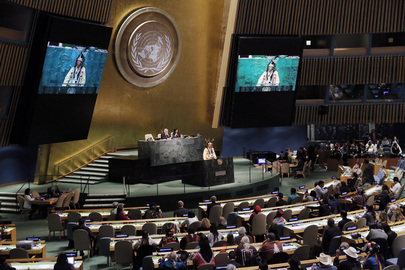 More than 1000 indigenous representatives from around the world have gathered at the UN for the 16th session of the UN Permanent Forum on Indigenous Issues (UNPFII). This year’s meeting focuses on the UN Declaration on the Rights of Indigenous Peoples (UNDRIP) which was adopted 10 years ago by the General Assembly. 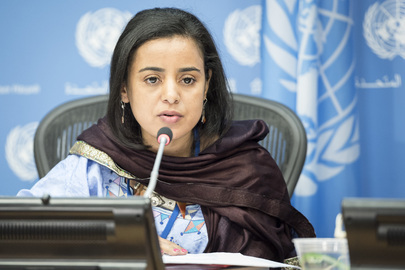 “On the day of the adoption of the declaration, there was a major change in the recognition of the rights of indigenous peoples,” said this year’s UNFPII Chairperson Mariam Wallet Aboubakrine during the opening ceremony. 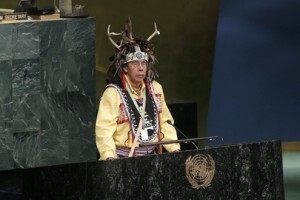 Ermineskin Cree Nation Chief Willie Littlechild echoed similar comments, stating that indigenous communities had no voice in the international arena until the 1980s when discussions first began on creating a special instrument to protect indigenous peoples worldwide. Alongside the Declaration, the UN now has four mechanisms focused on indigenous communities, including UNPFII and a Special Rapporteur on the rights of indigenous peoples. “Coming from no voice to four mechanisms at the UN, I think that is a significant accomplishment,” Littlechild stated. The 2030 Agenda for Development, adopted in 2015 by the international community, also directly involves and references indigenous issues unlike its predecessor the Millennium Development Goals (MDGs). However, many challenges remain in implementing and enforcing UNDRIP. After formally adopting UNDRIP in 2016, many have said that Prime Minister Trudeau has violated the document by approving several controversial pipelines without full consent from indigenous communities whose lands would be impacted. One such pipeline is the Trans Mountain Expansion pipeline which received support from 40 out of 139 First Nations living along the planned route. The right to lands, territories, and resources is also among the most important provisions of the Declaration. Both Aboubakrine and Littlechild highlighted the importance of inclusive discussions and decision-making at the international and state levels to ensure the protection of indigenous rights. “Some of the traditional knowledge of elders is critical to making sure there’s safe development if that is what is agreed to or to protect the environment,” Littlechild told IPS. Aboubakrine stressed the need for UN agencies to communicate and coordinate in order to effectively and meaningfully enforce UNDRIP. “It’s moving along, but I’m just concerned we are not moving along with it,” Littlechild concluded. Indigenous communities around the world face disproportionately high rates of poverty, poor health, and discrimination. According to the UN Department of Economic and Social Affairs (DESA), indigenous people constitute 5 percent of the world’s population but make up approximately 15 percent of the world’s poorest. The 16th Session of UNFPII aims to address challenges and highlight progress in indigenous rights at the UN headquarters from 24 April to 5 May.